The Lady Eve's Reel Life: Happy Birthday, Tyrone Power! 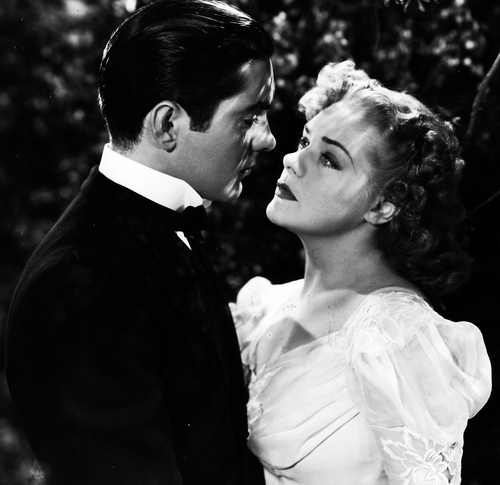 Today, on the 99th anniversary of Power’s birth and the 98th anniversary of Alice Faye’s, Turner Classic Movies will air one of their hits from the 1930s, Rose of Washington Square (1939). The film, the third and last pairing of Power and Faye, was a barely veiled fiction based on Fanny Brice’s rise to fame and her tumultuous relationship with her second husband, professional gambler Nicky Arnstein (Brice was incensed and sued Fox for defamation of character - the case was settled out of court). TCM and the Fox Movie Channel are airing a broad range of Power’s films this month – click here for a schedule. 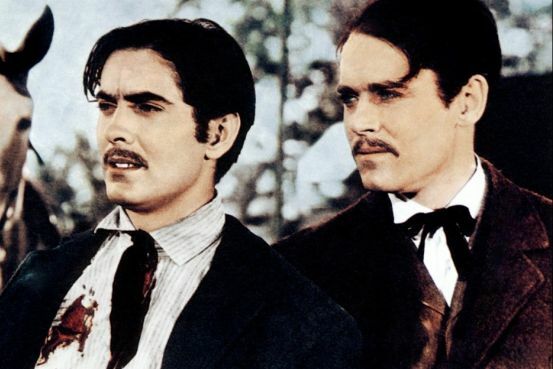 Tyrone Power’s centenary will be celebrated in 2014 with film retrospectives in his hometown as well as in New York and Los Angeles. Click here for more information. To learn more about his life and career, click here. My absolute fave Tyrone Powers role is "Witness for the Prosecution". I think it's a mesmerizing performance. I can't pick a favorite, but his performance in "Nightmare Alley" is a tour de force. I'm a huge Tyrone Power fan and I loved all the movies he did with Gene Tierney!! Dawn, My favorite of their films together is "The Razor's Edge." Wish he had been available when "Leave Her to Heaven" was made - he would've been perfect in Cornel Wilde's part. Ty missed out on more than one choice role because of his military service during WWII. Lady Eve, far too much time has passed since I last visited your blog, and what a lovely surprise to see Ty Power featured as your most recent subject. I admit his birthday would have passed unremembered (by me) if I hadn’t seen your post. I was suffering a bit of unresolved conflict due to TCM’s scheduling Rose of Washington Square during Mad Men’s time slot . . . now would be a good time to have a DVR service. I am genuinely looking forward to next year's "Ty Love Fest," as it is only fair and about time (it must be the eyebrows, the man had the most sensual eyebrows). As I fellow Cincinnatian, I must say Happy Birthday as well. He was so handsome--it must be in our water! Hope you'll be reporting on Ty's centenary celebration in Cincinnati, Kim. I'd like to. They haven't named a venue yet, so we'll have to wait and see what gets lined up. Tyrone Power will forever remain 25 years old in my mind. Thank heaven he isn't alive now! I simply couldn't bear to see him as a 99 year old Mr. Magoo ( although I'm sure he would still be flashing those dark penetrating eyes at young ladies ). I wonder why TCM chose to air "Rose of Washington Square" and not "Alexander's Ragtime Band" as the first film in the Power tribute this month. TCM aired "Rose of Washington Square" back-to-back with "Funny Girl" - a mini-Fanny Brice tribute, I guess. Ever since it came to a licensing agreement with Fox last year, TCM has been airing more Tyrone Power films - this was the first time "Rose" aired on TCM. "In Old Chicago" is coming up at the end of this month - possibly its debut on TCM, too. I have a feeling that, had he lived so long, Tyrone Power would've been the most attractive 99-year-old the world has ever seen. I am intending to host a 100th birthday blogathon in his honor next year, just as I did for John Garfield's this year. He was far more than just a beautiful face, and he deserves much celebration. Patti, Let me be the first to say "I'm in!" for your blogathon to celebrate Ty's 100th birthday. So glad you're going to be hosting the event, he so deserves it. I think it will be a big hit - a biographical piece I posted on him on his "Summer Under the Stars" day on TCM last year is one of the most read and most commented on posts I've ever published on this blog. Thanks for the info Eve. I'm hoping the NJ venue is the Loews in Jersey City. It has seen better days but it is a true movie palace and would be a great place to honor this great star. Hi Gilby, Last I heard, the Village East Cinema in New York may be the venue in your area. Will be posting more as I learn more.